Not surprisingly, reaction from the beer geeks in Florida was fast and furious, with vows to never let Cigar City touch their lips again if the sale happened, to the claim that the Tampa brewery’s sale would not have any effect on Tampa Bay’s beer scene “at all”. The venom was prolific, the hyperbole pretty astonishing. And the journalistic merits of the article itself heavily called into question, and rightly so. 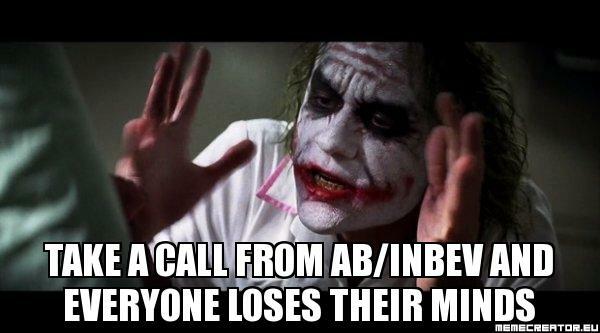 AB/InBev acquires other businesses as part of their business model. That is not new to anyone who follows the industry. They own Goose Island in Chicago. They have minority ownership in Redhook, Widmer, and Kona Brewing. These are not stupid people running AB/InBev. They see the market trends and the assess how they can profit from them. Like it or not, it is an effective model. Cigar City Brewing is successful, well recognized, and in the top tier of Florida breweries in regards to size and perceived value. Of course ABI would be interested. Wayne (in response to the suggestion of Jai Alai national distribution) – There would not be immediate increase in Jai Alai production in such a manner to distribute nation wide. It is impossible to do that and have the beer be true to brand. The big issue is the allocation of hops to produce the beer. Some of the hops are not standard issue. At that point, the brand would out grow the raw material chain. It’s inevitable either way. Joey – So that meeting took place BEFORE the 10 Barrel and Elysian deals closed. There hasn’t been a second meeting in that time. Draw your own conclusions and remember newspapers can troll too. Joey – It is a moot point anyway. We took a meeting. It ain’t much of a story. Wayne (posted on his Facebook wall) – We are not selling to AB. If you read this, please spread the word. I am humbled by the fact that many people are concerned and have sent me personal messages but everything is fine. Enjoy your beer and relax. Joey – For a hundred million, I’d stop liking beer. One thing that so many of the beer lovers forget is that while we all like to think it is all about the beer, for the people that do the brewing and run the breweries, it is also about the business. At the end of the day, when they do the books, the numbers better be black. While very few people get into brewing to get rich, none go in to fail. A word of caution before I sign off: beware articles about the industry written by someone with little knowledge of it. And before you go screaming to the heavens “WHY HATH THOU FORSAKEN MY BEER?!? !” you need to a) gain a little perspective, and b) maybe ask around to get clarity on things. ~ by Sean Nordquist on February 9, 2015.